The Riverfly Census can now show the impact of pesticides on water quality in addition to the threats from nutrients, sediments, organic pollution and river flow. This is thanks to the incorporation of SPEAR modelling into his biometric finger printing by Dr. Nick Everall and his team at Aquascience Consultancy Limited. This development is hugely important. Chemical testing for pesticides is costly and difficult. Pesticide pollution can be fleetingly brief, wrecking damage but dispersing between the EA’s chemical sampling dates. Invertebrates live in the river. They will show the impact of pesticide pollution long after the pollutant has dispersed. Invertebrate sampling and analysis is also much cheaper than its chemical counterparts. 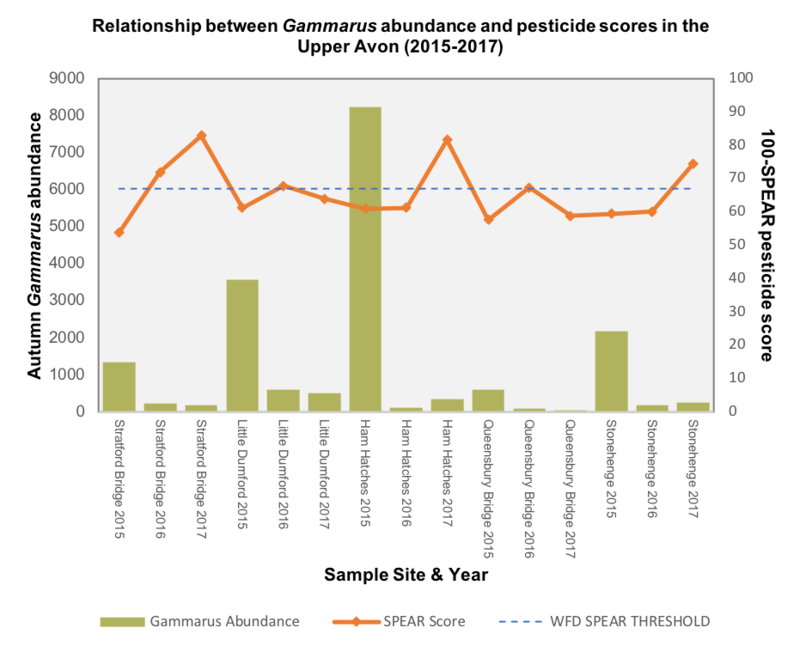 By inputting our species-level results into the tool, known as SPEAR, we have demonstrated a clear impact of pesticides in several Census rivers including the Avon, the Wensum and the Welland. We will be incorporating a full SPEAR analysis of all our Census’ rivers in the full report due later this year. Widespread harmful pesticide presence in UK rivers was recently highlighted by Buglife, in a report based on Environment Agency data. However, the Buglife report needed S&TC’s Riverfly Census data to provide evidence of actual ecological damage by showing the impact of pesticides on aquatic bugs. The combination of our Census’ species-level data and SPEAR allows us for the first time to assess the impact as opposed to the presence of harmful pesticides. Results from the Avon and the Wensum indicate that pesticides are impacting water quality on top the phosphate and sediment pressures already shown in the Census. The Wensum’s water quality has ranked poorly throughout the three years of the Census while the Avon’s quality has nose-dived from good in 2015 to poor in 2017. Three of our five sites showed a moderate pesticide signature in the autumn 2016 results. In autumn 2017, again three sites showed a pesticide signature but this time two sites scored poorly (Stratford Bridge and Ham Hatches) and one moderate (Stonehenge). The impact of pesticides on the Wensum appears wide spread. 57% of the 30 samples we took at 5 sites during 2015, 2016 & 2017 on the Wensum had a pesticide biological signature of moderate or worse. Fakenham Common showed a pesticide signature for all samples except spring 2016. Pensthorpe Nature Park showed a pesticide signature for all samples except Spring 2017. Two of the samples achieved bad, demonstrating a high impact of pesticides on the biology here. We are very excited about the powers of SPEAR and its potential to answer some of the big questions we all have about what pesticides are doing to our water life. We are keen to work with the EA to seek wider adoption of SPEAR in their invertebrate water quality monitoring and river classification under the Water Framework Directive (WFD). In Europe, these measures of pesticide biological signatures are classed as WFD threshold failures for good ecological condition. We have already started analysing historic EA results with SPEAR. We firmly believe the tool can be a great asset our quest to achieve more informed and effective management of our rivers.